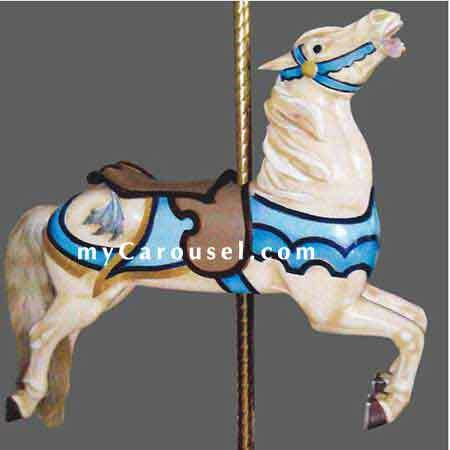 Circa 1910 from the Charles Carmel carousel works, Brooklyn, NY. The stargazer jumper with fore swept mane bears a saddle having decorative batwing pendant at the cantle and a notched skirt over a fringed blanket. The chest is encompassed by a double layered scalloped peytral with complementary breeching at the hindquarters. Glass eyes and natural horsehair tail. Very good older restoration, minor seams showing at leg and body.